I am so excited! I am going to Italy this spring for my mother’s 70th birthday. This will be my third trip to Italy. 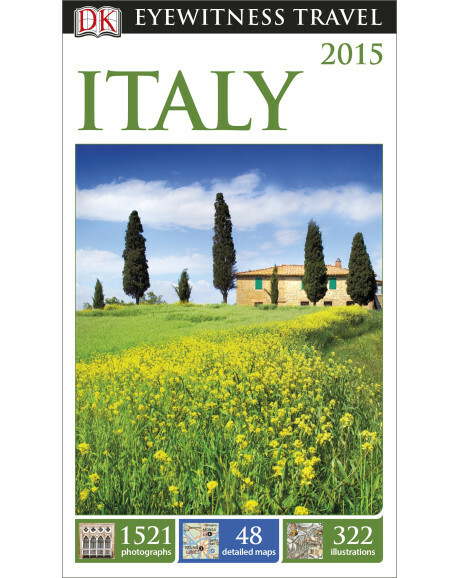 When DK publishing asked what travel books I wanted to review, I of course chose Italy! I also chose Paris as a future destination and a place I had already been. Extensive itinerary recommendations help plan trips to Italy by length of stay and by interest, whether you have just one day to spend in Rome or a week in the countryside, or are looking for a gourmet tour. Neighborhood walking maps show you the sights at a glance and help you make the most of your visit. Hotel and restaurant listings include DK Choice special recommendations. Inside DK Eyewitness Travel Guide: Italy, you’ll find DK’s famous cutaway illustrations of major architectural and historic sights, museum floor plans, and 3-D aerial views of key districts to explore on foot, along with in-depth coverage of the country’s history and culture. Maps are marked with sights from the guidebook and include street finder guides for Florence, Rome, and Venice. With hundreds of full-color photographs, hand-drawn illustrations, and custom maps that illuminate every page, DK Eyewitness Travel Guide: Italytruly shows you this country as no one else can. Looking through this book, I am even more excited for this trip! Phone numbers, hours of operation, websites, etc. are given for sites. The photographs are beautiful, and there are recommended places to eat and stay. The maps are handy for planning your trip, but I prefer to use my iPhone to look less like a tourist (and potential pick pocket victim) on the streets. I wish there was more information about public transportation. It is included, but it isn’t as clearly spelled out as I wish. Neighborhood walking maps include restaurant locations by area. Inside DK Eyewitness Travel Guide: Paris you’ll find DK’s famous cutaway illustrations of major architectural and historic sights, museum floor plans, and 3-D aerial views of key districts to explore on foot, along with in-depth coverage of the city’s history and culture. A pull-out city map is marked with sights from the guidebook and includes a street index, a Paris Metro map, and a chart showing the walking distances between major sights. This guide book suggests some great 90-minute walks that look amazing. I haven’t been to Paris for 25 years, and this book is bringing all my memories back! It also features a pull-out map. It’s really great to have updated 2015 versions of travel books! I want to explore this great world we live in! DK’s corporate responsibility covers concerns about the paper use, worker safety, and energy used in publishing. It is our duty to think about the entire journey our books take from forest to printed page. We are committed to treating the members of our supply chain fairly, right back to the forest owner – sharing with our partners a care for the environment, respect for local communities and a concern for all the people who work on our books.